This activity is meant to help your participants discover and develop their dreams and goals. Dream Catcher is based on the SMART goals theory that goals and dreams must be Specific, Measurable, Attainable, Relevant, and Time-Bound. Organize participants into a circle and place the bucket in the middle of the circle. Round 1: The goal is for each participant to say their dream and place it in the “Dream Catcher” as quickly as possible. Round 2: Challenge the participants to restate their goal, making it more specific and time bound. The team still has the same goal for this round: Each participant says their dream and places it in the “Dream Catcher” as quickly as possible. Round 3: This time the group gets even more specific and has the same goal: Each participant says their dream and places it in the “Dream Catcher” as quickly as possible. In between each round, challenge the participants to really think about their dream and start to “own it” by declaring that they will achieve their dream each time they share it with the group. The group always has the goal of completing the activity as quickly as possible while every participant “achieves” their dream. They may start out by tossing their dream into the Dream Catcher or even running to the middle to place their dream in the Dream Catcher. There are no rules on how their dream gets into the Dream Catcher, and they can even pick it up and pass it around the group. You can use this activity just as a dreams activity without the actual initiative involved. Do the activity with five rounds and follow the SMART goal steps. Were the participants inspired by each other’s dreams? Were there any ideas or options to help them more quickly “achieve” their dreams? Could they have moved the bucket? Are there any things in their actual life that could help them achieve their dreams? Use the processing time as an opportunity to help the participants plan out ways to achieve their dreams. Challenge the participants to come up with a dream that is actually achievable or attainable. Almost everyone has a goal or a dream, but many do not know how to make their goals SMART Goals. This activity will help participants make their goals more specific, measurable, attainable, relevant, and time-bound. Props: A piece of paper per participant (any size will work, but the larger the better) & writing utensils. Give participants a piece of paper and ask them to fold the paper in half 5 times. For the last step, ask the participants to unfold the paper one last time, flip it over, and write their new SMART Goal. Ask them to sign the paper and date it. After the activity, the participants should now have a piece of paper with their SMART Goal, some factors that say how they could achieve the goal (attainable), their reasons for attaining that goal (relevant), and a date to accomplish the goal (time-bound). Encourage participants to draw or paint their goals, this will help them become more realistic. Bring old magazines and newspapers, scissors, and glue to let the participants make their last page into an art masterpiece. What did it feel like once you had a SMART Goal? Do you feel like you are closer to achieving your goal now? What is the next action step now that you have a SMART Goal? What were some of the things on your relevant page? Why do you want to achieve this goal? Who can help you achieve this goal? It is usually very beneficial to combine this workshop with a brief introduction to SMART Goals. 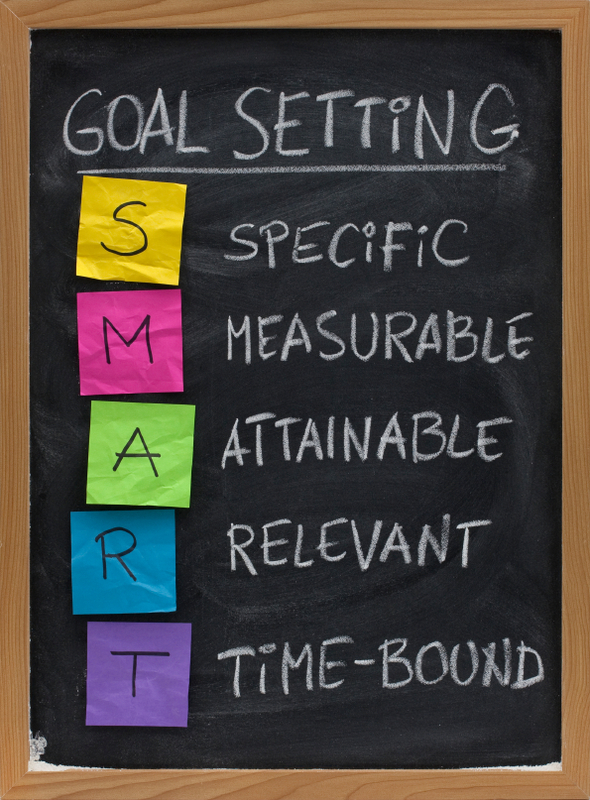 It works to explain SMART Goals either before the activity, or as a step-by-step guide during the initiative. Let me know if you have any questions on how to implement this into your program or have any ideas on how to use SMART Goals Paper Fold. If you would like to receive information regularly that will include new and fresh activities and materials, please subscribe to my blog by clicking here. You can follow us on Facebook by clicking here or on Twitter by clicking here. Way back on January 1 of this year I declared my goals and resolutions for 2012. Yesterday, July 2, was exactly the half-way point for the year, so I decided to check up on my goals and evaluate my progress. Last Friday I took a fitness assessment at our wonderful new gym. The personal trainer took me through a variety of tests which compared my metabolic age to my actual age. After the strength training and cardiovascular portions of the exam I had the prowess of an 18-year-old. I had the body-fat percentage of a 25-year-old. So far it was looking good for your old pal the goal-setter. The test was not over unfortunately…I still had to take the flexibility assessment. 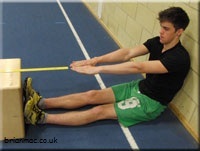 The trainer sat me on the floor and asked me to reach as far as I could toward a box against the wall. Most normal people were asked to push a sliding lever as far as they could on top of the box. The trainer asked me if I could touch the lever (I’m not going to tell you if I could or couldn’t…I couldn’t). I had the flexibility of a 70-year-old man, and I think that is only because that is the maximum age on the metabolic scale. I tell you this story because I have not stuck to my New Year’s Resolution. I had all these plans to stretch every day, to sit on the floor and touch my toes while I watched TV, to stretch before and after exercise. Unfortunately, I have decided to sleep in everyday, eat while I watch TV and jump right into exercise. I know my weaknesses, and flexibility is on that long list. I am going to start stretching every day, my assessment at the gym was a real wake-up call. If I do not change something I am going to become an old, brittle, inflexible man someday. That changes this second half of the year. The trainer showed me some great stretches, and gave some solid advice, and I feel as if I am on the right track. Goal #1: Pay off student loans. Kristin and I paid off our student loans (well, my student loans) in February of this year. According to Dave Ramsey, we now completed baby step number 2, and we are moving on to baby step number 3. This was a huge relief for us, since the only debt we now have is our mortgage. This frees up money for us to save, share and give. Goal #2: Save $10,000 for an emergency fund. We are well on our way to completing baby step number 3. Having money in our emergency fund will allow us to put more money into retirement, save for baby Jane’s college fund (or her extravagant wedding), and will allow us to have financial flexibility heading into 2013 and beyond. Goal #3: Facilitate 25 paid EA events. As of July 2nd, I have facilitated 13 Experiential Adventure workshops. I love doing these trainings, and I have several more in July to help me achieve my goal. I have facilitated in three states and Brazil. This is one of my goals I am the most excited about, because I thought it would be one of the hardest to accomplish. Brazil Baby! What a wonderful trip. I am currently working on a post specifically reserved for the amazing things we were able to do in Campinas, Sao Paulo and Rio. This is the second continent we have facilitated on, and we hope to add one more to the list before the huge Antarctica trip in 2014. This one was completed in a hurry. Murr, my personal assistant, was able to find a training in Boston in January that fit our needs. We loaded up on a plane, flew to the Northeast and had a wonderful time. Our experiences at PA strengthened my resolve, stretched my abilities, and increased my repertoire. I fully intend to have this goal on my list in 2013 since this training was so beneficial. Also, because of Murr’s excellent personal assistance during this trip, I have noted it on his annual performance review. Goal #7: Check 12 things off of the Bucketlist. I love my Bucketlist. So far I only have checked four things off my list this year. Spend the night in a haunted house. Eat at a Brazilian Steakhouse in Brazil. Visit an orphanage in a foreign country. Stand beside the Christ the Redeemer statue. I fully expect to check more things off of my list when I have the opportunity. I have already booked a trip to Europe at the end of this year, and will certainly get to check off a few more (1. Try to make a guard laugh at Buckingham Palace, 2. See Stonehenge, 3. Kiss on top the Eiffel Tower, 4. Walk around the Colosseum in Rome). However, I still have some work to do before I can accomplish this goal. I still want to skydive, bungee jump, visit Mt. Rushmore and get six-pack abs. Of course, if something awesome happens between now and then that is Bucketlist worthy, you better believe I will add it to the list and then check it off. Goal #8: Set a World Record. I will admit…I have done absolutely nothing to achieve this goal. I have done all of the necessary paperwork to set a world record, but I have yet to train or attempt to have my name entered into the Guinness Record Books. After I complete the Branson Half-Ironman in September, I hope to focus more of my time on this goal. Goal #9: Get six-pack abs. I currently weigh 200 pounds, and I will not achieve this goal unless I weigh no more than 185 pounds. I have exercised and trained fairly well for the past six months, but I have not achieved the results I desire. I am putting in extra time right now to achieve this goal. I know the six-pack is under this layer of fat, I am just trying to find it. Goal #10: Get back into church. Kristin and I attend Sanctuary in South Tulsa, but they just moved their campus to Jenks. We are searching for a new church that Jane can grow up in and establish her own faith. The trip to Brazil did wonders for my faith, and I am continuing to grow as a man and as a Christian. Welp, those are my goals I set forth over 6 months ago. Three goals are completed, and most of the others are over halfway there! Help keep me accountable. If you see me, ask me how my goals are coming along. How are your goals at this halfway point? There is still so much of 2012 left to accomplish amazing things. If you haven’t started on your goals, write some down and start accomplishing them today. Welcome to 2012! How was your 2011? My 2011 was awesome, and in case you missed it, we welcomed Sweet Baby Jane, I traveled to Cuba, completed The Labor Day Challenge, wrote a book, and of course started Experiential Adventure. This isn’t gross at all. Anyone that has ever witnessed me trying to sit on the floor knows I am ridiculously inflexible. Not just inflexible, but pathetically inflexible. It’s not that touching my toes would be nice, but I would jump with joy if I could touch my ankles. I would love to be able to sit on the floor without having to support my back. I do not know when I became inflexible, but I have struggled with it my whole life. I never passed the President’s Fitness Challenge as a kid because I failed the stretching test every year (dominated the run, however). Breaking my hip in high school and a lifetime of never stretching has made things worse over time. Becoming flexible has been a constant resolution on my get-better list, and obviously it hasn’t happened. Now, I am getting older, and it is getting worse. I plan to stretch for a minimum of five minutes per day. I plan to occasionally practice yoga. I plan to stretch after each workout. I will measure my progress by writing on my legs as I start to stretch lower and lower. (Not really..but maybe) Seriously though, I will be happy if I could touch my toes and sit on the floor with ease. You know what is awesome about goals? Very few people know how to realistically set goals. You may be asking yourself, “why would he say that is awesome?” It is awesome because once you correctly learn to set SMART goals, it is almost as if you are predicting the future. Whaaaaaaa? If you determine that you will positively, without a doubt, no questions asked make your goals a reality, you are determining the direction your life is headed. Eric Pio says, “If you know it’s going to happen there’s no need to call it a dream.” Let’s change our mindset about goals. Let’s become SMART about the goals we make for our life. Let’s start directing our future…might as well start today, might as well make 2012 the year. 1. Pay off student loans. I graduated…into $20,000 of debt! Going to college was one of the smartest decisions I have made in my short life. Some of the decisions I made in college, not so much. I started at NSU in the fall of 2001 as a bright-eyed freshmen with a full scholarship. I graduated 5 years later with a degree, amazing experiences, and nearly $20,000 in student loan debt. What happened you ask? Well, I’d like to blame it on a tough major (pre-physical therapy), my busy fraternity and social lifestyle, girls, or even my professors. However, I was lazy, unmotivated, and ill-prepared for the rigors of collegiate academics. I lost my scholarships and had to pay my own way. Eventually I regained my scholarships, and even attained a master’s degree, but not before I racked up thousands in debt. I do not regret the loans, I did what I needed to survive, but it will sure be nice to not have the $205 payment every month. Kristin and I owe $3,808.26 to student loan debt (Kristin graduated with 151 hours and a 4.0 in four years with no debt at NSU…I hope Jane is like her momma and not her dad!). We typically pay $205 a month to OSLA, but since it is the only debt we have other than our mortgage, we are able to pay more each month. We also plan on placing our entire 2012 federal tax return on the student loans. I expect to be out of student loan debt by March. 2. Save $10,000 for emergency fund. One of the most influential books I read last year was Dave Ramsey’s “The Total Money Makeover.” It was a eye-opening look at how to handle finances, and I have been following his plan with gazelle-like intensity since I finished the book. Ramsey explains “baby steps” a couple should follow to become debt free, and eventually rich. Step 1 is to save $1,000 for an emergency fund (check). Step 2 is to pay off all debt using the debt snowball (almost check). Step 3 is to save up 3-6 months emergency funds (2012 check). The reason Kristin and I have so little student loan debt now is because we nearly depleted our savings account paying our student loans. We still have the $1,000 emergency fund, but Ramsey suggests using your built up savings to pay off debt to avoid heavy interest payments. So far this has been extremely successful for our family’s finances. After we pay off our student loan debt in March, we will only have our mortgage as debt, and we will be able to place over $1,000 a month into our savings account. This was money we were paying every month into several different types of debt and interest, but now will be freed up to place in savings. 3. Facilitate 25 paid EA events. I started Experiential Adventure in January 2011 as an opportunity to make some money off of one of my hobbies. I truly envisioned it as a means to my dream of traveling with my work. If you know me at all, you know I love to explore the world, regardless of destination or reason. I thought Experiential Adventure would allow me to get paid to travel, meet new people, and hopefully share some of my passion of experiential learning with others who wanted to better reach their students/clients. I never dreamt that I would have presented events in four states and Cuba in one year. I facilitated at church camps, leadership camps, universities, and at ropes courses. The highlight of Experiential Adventure so far is definitely the Cuba International Leadership Conference, where we worked with 300 Cuban youth leaders to better reach their students. This upcoming year I want to facilitate 25 paid events. I have already booked 10 events for 2012, but my overall goal is 25. I hope to meet my overall EA goal of training trainers, presenting keynote addresses, and facilitating the international trips. I am going to follow-up my leads from exhibiting at SWASAP, and I am going to present in TX, OK, NM, LA and AR. As stated above, I traveled to Cuba in July of 2011 to host the Cuban International Leadership Conference. I have a long-term goal of hosting a leadership conference on 6 continents by 2014. I am currently at 1! We have researched hosting camps in Thailand, Brazil, and Australia in 2012, but it seems certain that our international leadership conference will be in Romania. Jerrod Murr, my personal assistant (inside joke) for Experiential Adventure is gathering the details of this trip as we speak. I am currently in the process of raising funds to make the trip a reality. Project Adventure is an experiential-based non-profit organization based out of the Boston area, and they are by far the Godfather of challenge course facilitating, adventure based programming, and all things awesome. I was fortunate enough to travel to Beverly, MA with NSU ETS in 2007, and this trip specifically ignited my passion for experiential learning and leadership. I have used their initiatives and activities with my students in Educational Talent Search, and with my EA programming. I need to go back. I need to enhance my skills. I need to meet the facilitators who are the experts in the field. I need to learn what it will take to become an experiential-based expert. I have saved up money and allocated some funds specifically for this training. As of now, the hardest part of making this trip is finding the time. I declare 2012 as Boston or Bust. I read about 20 books in 2011. Books of all types and genres covering 100s of years of literature. My favorite book of 2011 was “The Success Principles” by Jack Canfield. I also really enjoyed Karl Rohnke’s “On the Edge Games for Youth Leaders,” “Great Expectations” by Dickens, and “Of Mice and Men” by Steinbeck. I am about a quarter of the way through “The Leadership Challenge” by Kouzes and Posner, and I have a stack of books I am very interested in reading. A book a week. This will require steadfast dedication to reading, and I plan to set aside time every day to read. I will read on breaks, listen to audiobooks, and turn off the TV, computer, and iPhone in lieu of a good book. I don’t know if I will accomplish this goal, but I will certainly be better off for trying. 7. Check 12 things off the Bucketlist. Let’s be clear, I love checking things off my Bucketlist. I am constantly looking for things to add to my list an researching how I can accomplish these tasks. However, 2011 was not a good year for my Bucketlist.The only thing checked off my list was on June 28, when I took my first Yoga class. This year is going to be a different story. I am officially declaring 2012 “The Year of the Bucketlist.” I have a goal of checking 12 items off the list in 12 months. These are the 12 items I am going to try to accomplish. I will work very hard to accomplish one item each month throughout the year. Of course, if anything ridiculously awesome happens to me that I want to add to my list and check off…I’ll make it happen. 8. Set a World Record. I think most people want to set a world record. Most people aren’t able to, which is why it is a world record…makes sense doesn’t it?? This past year, I applied to attempt a world record. You can’t just break a record and then call the Guinness people to get your name in the book. One must apply to attempt a record, then get approval to break said record, and then break the record. I applied to attempt a unique record…”Fastest mile hopped on one-leg.” I heard back from Guinness and got the approval. I have been waiting for the right time to break this record…and I have decided 2012 is the year. I plan to “train” for this event once a week until I feel prepared to actually pursue the record. After I am ready, I will need to find an official timer for the event, and someone to officially measure the course. After these things happen, I simply need to break the record! Insert this goal under the self-vanity category. I have been half-way pursuing this goal for several years now (my whole life). I know this a frivolous pursuit, but I tell myself that the reason I want six-pack abs is to prove tom myself that I can do something ridiculously hard. I of course do this to ease my conscience a little. I have conquered being skinny recently, and it was a challenge. Getting a six-pack takes an unreal amount of dedication and perseverance. You not only need to be physically fit, you must workout consistently, eat well, and stay focused for months. It will literally take me almost all year to accomplish this goal. I have found an effective abs routine that works for me. The problem is it is no fun and very hard. I will complete this exercise 3 times a week. I will also follow the Abs Diet for as long as it takes to get the six-pack. I need to weigh around 185 to have a six-pack, and I currently sit at about 200 lbs. 10. Get back into church. Yes, I was that skinny! I recently facilitated activities at the Assembly of God Oklahoma Student Leadership Retreat in Turner Falls. This place holds a special place in my heart, and every time I go back I am flooded with nostalgia. I remember times of Mud Mountain, KP duty, Brandon Nickell and the MG, and of course awesome services in the old outdoor tabernacle. As I walked up the hill to the cafeteria past the concession stand, I thought about how important my church family was to me as a teen. I lived and breathed Muskogee First Assembly. I was there Sundays, Wednesdays, and any other day I could catch a ride to the church. I literally grew up under the pews. I was saved there, baptized there, and even married there. The fine folks at M1A helped me build the foundation of character I depend upon today, and I am who I am at my core in large part due to my tenure at that church. At some point I stepped away from attending church, not because I didn’t like it, but because it wasn’t convenient. I got busy, I had things to do, and going to a service on Sunday morning to hear someone preach something I had probably already heard did not fit into the schedule. In the next few months I am going to take Sweet Baby Jane back to M1A to be dedicated. I am going there for the dedication for a couple of reasons, primarily because of my past history and my parents involvement in the church, but partially because I have no where else to go. I am still a Christian, and I still have my core beliefs gained as a youth, but I have no home church. This needs to change in 2012. I know that my baby girl needs the same opportunity to seek in her life. A chance to see if growing up in church is the right thing for her. Kristin and I have already discussed, and every Sunday we are in town we are going to church. We plan on getting involved in a small group. We are currently attending a small group with our good friends the Hahns on Sunday nights, and we plan to keep that up too. Those are my goals. I hope that you didn’t fall asleep while reading my aspirations. I at least hope you enjoyed the photos. I am going to check in every quarter (every three months for you non-business types). I will update my results and hopefully my successes. What are your resolutions? What are your goals? Is there anything I left off the list? Is there anyway you can help me achieve my goals? (If you feel so inclined to help, Number 2 would awesome) I challenge you to develop your own resolutions and goals. I challenge you to take control of your future and make your life the life you have always desired. It starts today and continues tomorrow. Take this life one day at a time and 366 days later, it will be 2013 and we can build upon 2012.